Tokaido! Hi guys! As the title already tells, we will give you an insight into this game. We have asked the developer to answer our simple questions, so you guys know more about the game than you already do. Tell us more about Tokaido! You are a traveler on the famous Tokaido road in Japan. This road offers a lot of activities that you can make during your tourist trip. You won’t be able to do everything, but your trip will allow you to make good memories. All of your actions will enrich your collection. There is no need to be first; in Tokaido, it’s all about the travel. Tokaido is the video game adaptation of the board game and allows you to play against AI, players around the world, and even friends and family on the same device. The atmosphere of the game is peaceful but you will have to find a good strategy to develop your collection better than others. More and more games are released every day and a lot of developers are working hard to catch the public eyes. 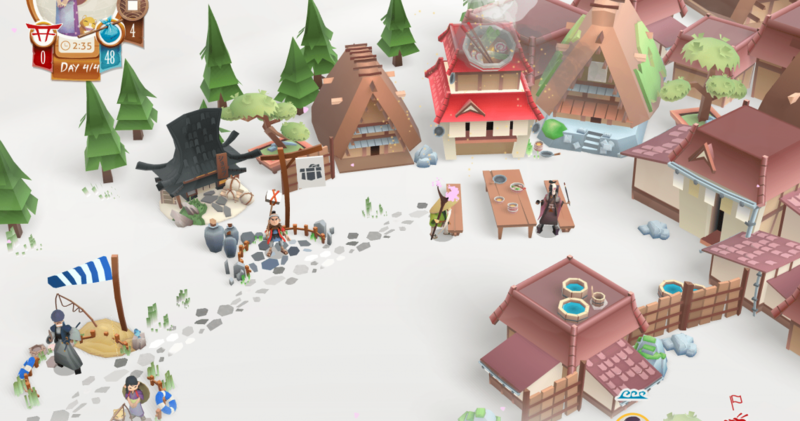 Tokaido has this catching unique art style and an accessible original gameplay, which can make the difference. Naïade, the illustrator of the board game, did a great job to transcribe the Japanese culture in a colorful cartoon way. We wanted to keep the same feeling of zenitude for the video game and bring it alive with 3D modeling and 2D animations. Antoine Bauza, the author of the board game, developed accessible game mechanics. So we had to make the video game simple to read and to understand on a single, sometimes tiny, screen. We think we achieved that and the video game as it brings a new experience to the players is truly coherent to the original game. We are honored to be part of the nominees and wanted to congratulate all the participants to the IMGAwards. Thanks to the people who played, tested and support Tokaido to be a nominee. Tokaido has proved us, as a board game, that the public likes it and constantly asking for more content to expand their journey. We are confident that Tokaido is appealing, and more new travelers will join us on the East Sea road when they will discover the video game. At this very moment, we are having our second judging session in Helsinki. All our judges flew in from their hometown to judge the games and to choose which wins what. We are very excited for the results. However, you guys, as supporters, are in control of the People’s Choice Award. Don’t hesitate and go vote!